The Planetary Society has deep concerns about the continued effort to defund Planetary Science in NASA’s 2014 budget proposal. The budget ignores Congress’s rejection of similar cuts proposed in FY13 as well as the public’s strong support of this highly effective part of NASA. The proposed cut threatens U.S. leadership in deep space exploration and planetary research, and it creates negative long-term technological and engineering consequences for the aerospace industry. Without immediate investment in technology and mission development – not possible under the FY14 proposal – the United States will go “radio dark” in almost all regions of the solar system by the end of the decade. In challenging economic times, we encourage Congress to support the part of NASA that has consistently delivered on its promises: Planetary Science. On August 6th of last year, millions of people around the world watched as NASA’s Curiosity rover landed on Mars. It was NASA’s greatest – and most visible – triumph in years; the result of a decade’s worth of steady investment in planetary exploration. Curiosity captured the public’s imagination, becoming the “Apollo moment” for a new generation of Americans by inspiring countless numbers to pursue careers in science, math, engineering, and related fields. But the FY14 budget does not support the robust investment in Mars exploration required for there to be any more “Curiosity moments.” NASA was able to assemble a new mission for 2020 that duplicates the design of the Curiosity rover, but there are no longer the resources for long-term technology development to create the next generation of missions to the Red Planet. It is not clear whether the 2020 Rover will follow recommendations of the National Research Council’s Planetary Science Decadal Survey and cache samples of Mars to be returned to Earth in the future. The FY14 budget and its projection ensure a moribund future for our Mars program. The proposed budget for FY14, $1.217 billion, represents the latest in a multi-year effort to underfund Planetary Science within NASA [fig 1]. Though this number looks larger than was projected in FY13, there are important caveats to consider. Included in FY14 are two new requests to the program: $50 million for Pu-238 production previously located in the DOE budget, and $20 million for near-Earth object (NEO) detection in service of the asteroid retrieval mission. While both of these are important, we must consider $1.147 billion to be the “true” number when comparing to last year’s appropriation. As such, FY14 represents a $268 million cut from levels approved by Congress in FY13 (before sequestration and rescission). 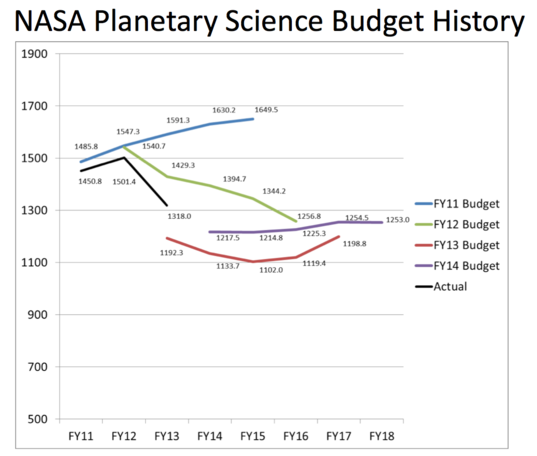 Comparison of budget projections for NASA's Planetary Science Division (in millions of dollars) over the past four years. Note that the “Actual” line assumes an even application of the sequester and rescission for FY13 and the FY14 budget includes the new funding for Pu-238 and NEO detection. The FY14 budget also ignores the $75 million approved by Congress in FY13 to begin formulation activities for a mission to Jupiter’s moon Europa and dismisses any possibility of a mission in the near future. We urge Congress to provide continued funding for a Europa mission and to encourage NASA and the Administration to commit to this popular, scientifically important project. The Planetary Society would like to highlight one positive aspect of the FY14 budget, which is that proper funding is requested to restart Plutonium-238 (Pu-238) development. Pu-238 is a power source for spacecraft that cannot use solar panels, such as missions to deep space or to targets bathed in shadow. The United States stopped producing Pu-238 in the late 1980s and our supply is now at critical levels. It takes many years to generate usable plutonium, and we strongly encourage Congress to fund its development as requested to prevent future shortages. In difficult economic times, The Planetary Society recommends that Congress prioritize the effective and productive Planetary Science Division within NASA and fund it at $1.5 billion per year. This is a modest increase above the request and represents less than 9% of NASA’s total budget while supporting an extremely successful part of the agency. According to our analysis, this level is the minimum necessary to support a balanced program that follows the recommendations contained within the NRC’s Planetary Science Decadal Survey, which includes a flagship mission to Europa. NASA is one of the great scientific and cultural institutions of the United States. It has the unique responsibility of inspiring the public through unprecedented achievements in human and robotic exploration into the depths of space. Decades of strong, bipartisan support of NASA have created the world’s leading engineering and scientific space agency. In challenging economic times, we encourage Congress to support the part of NASA that has consistently delivered on its promises: Planetary Science.